Nitrozac paintings: "Woz, Jobs and the Apple" 11"x14" oil painting by Nitrozac *SOLD*! "Woz, Jobs and the Apple" 11"x14" oil painting by Nitrozac *SOLD*! Ta Da! The 15th painting of my Painting A Day Blog! It is my loving homage to that crazy world-changing moment in tech history; a moment especially deserving to be immortalized in a painting. 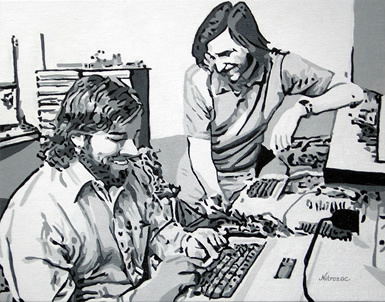 I was inspired by this famous photo of Woz and Jobs as Apple computers is being born. I drew the black and white photo for this comic of the Joy of Tech. I thought that it looked interesting in the comic, so I decided to do an 11"x14" painting of it. 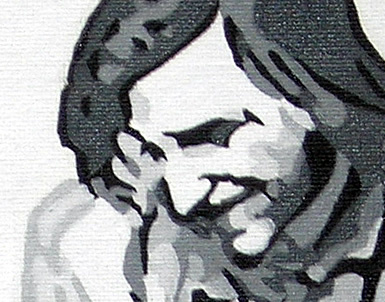 I painted it in a grey scale like the original black and white photo to emphasize the nostalgic quality of the image. I intentionally painted it using the solid shapes of the vector drawing, and I like the effect that technique created in the painting. It's not photo-realistic as much as it's impressionistic. There's a dreaminess to the painting, and a sort of movement, an unrealness. I'm very proud of this painting. Woz and Jobs look so happy, and there's a geeky innocence about them in this picture. It's a moment in time when they had no idea of the implications their invention would have. In this capsulized moment, they are simply a couple of happy geeks. Who would've thought that they would spawn a whole industry! It's sort of romantic in a way. This painting was a labour of love; it took me a quite a while to paint. It's also the largest painting I've done so far, 11"x14", which is quite a nice size. Just think, this original oil painting can be yours to cherish and love forever and ever! I think it would be an insanely great idea to go and bid early and bid often on it, don't let this one slip through your fingers! Good luck!